BBC America is now showing classic Doctor Who. I am not sure exactly when they started running the older episodes but, while flipping channels this morning, I ran across “The Seeds of Doom” from 1976 (I just missed - I think - “Genesis of the Daleks”). Anyway, according to my Directv schedule every morning at 10 AM EST they will be showing a complete classic serial, plus running a couple on the weekend. 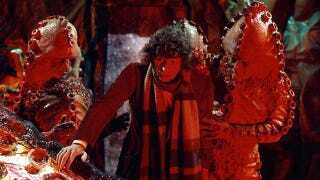 Starting Monday the stories are “Terror of the Zygons”, “Pyramids of Mars”, “The Hand of Fear”, “The Brain of Morbius”, then “The Robots of Death” on Friday. Sunday at 8AM EST comes “City of Death” followed by “The Keeper of Traken”. Next week’s morning episodes are “Logopolis”, “City of Death”, “The Keeper of Traken”, “Genesis of the Daleks”, and “Terror of the Zygons”. Unlike when they ran classic episodes for the “Best of ...” series and sort of stretched - warped, really - the picture to fit new televisions these (or at least “The Seeds of Doom” so far) are being shown in the original ratio, though they do appear to be remastered (or seem to be a better picture quality than my DVD’s) to my old eyes. Also the serials have been edited together like when they ran in some PBS markets (or on the old Playhouse video tapes), so no cliffhanger endings. Anyway, everyone may have already known this and I am just late to the game, but I thought I would give folks the heads up.